Not my usual non-fiction book but because I enjoy train travel so much (visit my train travel web pages) and have been around the country on Amtrak, and taken a few other trains here and there, I thought I'd add this title to my reviews. It's an enormous book divided into sections; Steam Locomotives; Diesel Locomotives and Trains, and Electric Locomotives and Trains. The information is arranged in years and covers the evolution of these machines throughout the world. Gone are the days of romantic train travel (perhaps still on the Orient Express) across vast expanses of land but here and there you'll come across revived steam locomotives doing their thing. The life of the train began in England and quickly spread to Europe and America and train services are still functioning and flourishing to this day. However, a lot happened from the first single locomotive back in 1825 and the later twentieth century's bullet and high-speed trains. Trains were initially used to haul coal and minerals but progressed to transport animals and more often today, passengers and goods. Train trips through the Rockies or the Alps are tremendously exciting, as are desert crossings. It's a wonderful way to travel and see the world. This book is beautifully illustrated with pictures and drawings of some of the most magnificent machines you're likely to ever see. Thankfully many have been preserved and housed in museums. 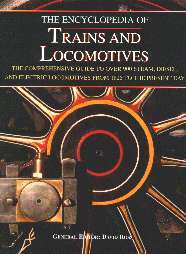 The Encyclopedia of Trains and Locomotives may be purchased and/or ordered through your local bookstore. Conclusion - A must for train fanatics and enthusiasts.